Until recently, when I was idly flicking through the depths of my kindle library and I discovered it again and dived in. Oh, dear reader. What a *fool* I had been. Vicious is, quite simply, splendid. The format can be challenging to start off with as the timeline jumps between ‘last night’ and ‘ten years ago’, ‘a week ago’, ‘two days ago’ and so on. Keeping track of who’s doing what to who and when threw me a little, but soon you fall into the rhythm of the story and start to appreciate the craft on display. V.E. Schwab shows a deft hand at weaving the various narratives across the intertwining timelines, always leaving you wanting a little (or in some cases a *lot*) more. The characters all have their flaws, and, in the most part aren’t particularly nice people. This attests to Schwab’s skill as a writer as despite this, you can’t help rooting for our merry band. Maybe not so much Eli and his almost evangelical self-imposed mission to rid the world of the EOs, but I found myself torn by the end, both wanting Victor and the scooby gang to prevail, but not at the expense of Eli. I loved this book, and was thrilled to discover that book 2, Vengeful was imminent. 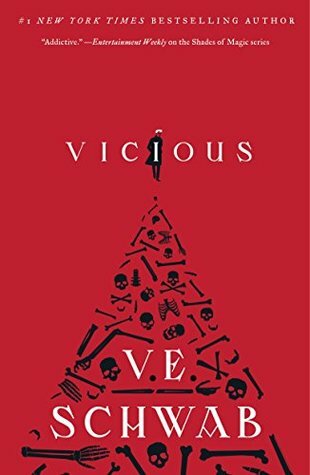 So whilst Vicious had languished on my shelves virtual and physical for entirely too long, it did mean that I didn’t have too long to wait, and having just finished Vengeful, a review will be along shortly! I’ve just added this to my list. It sounds great!